Preheat the oven to 180 degree Celsius. Grease individual pudding moulds with REAL Ease and line the base with baking paper. Place the chopped figs in a bowl with coffee and soak for 15 minutes. Beat butter and sugar until pale and creamy. Beat in eggs one at a time until combined. Stir in baking powder and flour until smooth. Add pecans, soaked figs and any remaining coffee, stirring to combine, and then stir in water. Pour batter into individual moulds. Cover with baking paper and foil. Bake for about 40 minutes or until a skewer inserted into the centre comes out clean. For the toffee sauce, heat butter and sugar until the sugar dissolves and caramelises. Remove from heat and gradually stir in CARTE D’Or Crème Anglaise. 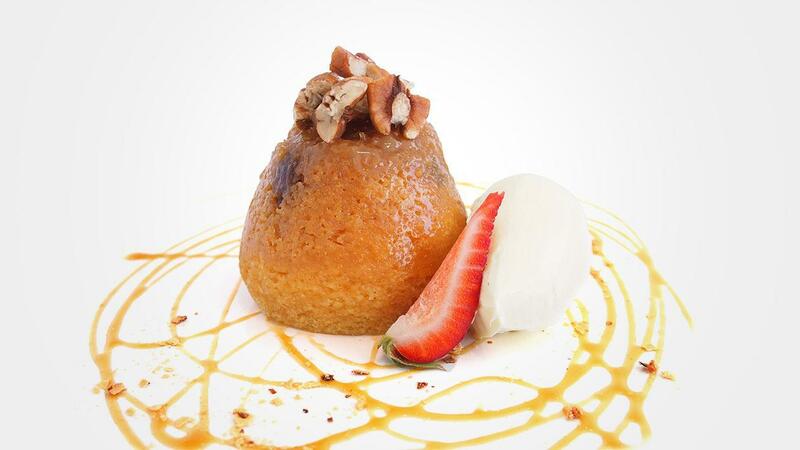 Turn pudding out onto a serving dish, scatter with extra pecans and drizzle with toffee sauce. Garnish with vanilla bean ice cream and strawberries.